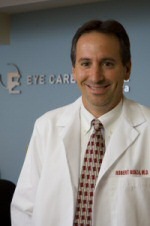 .MD Wellness Experts | Protect those eyes! Many of our patients ask us about Glaucoma. It seems to be a confusing topic even though there are millions of patients with this condition in the United States. Glaucoma is a problem with the optic nerve (damage), often associated with elevated eye pressure which causes peripheral or side vision loss. Patients typically have no symptoms which creates a real problem unless they have routine eye examinations. Glaucoma can be diagnosed in the office with a good exam. Many patients have an elevated eye pressure associated with a change in the optic nerve (nerve in the back of the eye which connects the eye to the brain for vision). If the optic nerve looks suspicious, your eye physician may perform a visual field (side vision test) in the office to check the peripheral vision. If there is a change in the field, the patient is typically diagnosed with glaucoma. At that point, further testing may be performed to determine which type of glaucoma is present. Early diagnosis is the key to treatment. Most patients with glaucoma can be controlled with eye drops. We now have a wide variety of pressure lowering drops which work extremely well. Many of these treatments only require a once a day drop. For patients with higher pressures or glaucoma for many years, they may need multiple drops or even a laser treatment in the office which only takes a few minutes and can be 80% successful in lowering pressure. For more advanced cases, there are surgical procedures which can be helpful as well. As mentioned earlier, glaucoma can be treated successfully especially when diagnosed early. Since there are few to no symptoms, we greatly encourage our patients to have routine eye examinations in order to rule out any of these silent problems which can threaten vision. As always, preventative care even with the eyes is very important. Protect those eyes! !